Ancient custom Wikitravel extension, used only on Wikivoyage and unmaintained. Adds duplicate links to other Wikimedia wikis (now handled by Wikibase) and harmful links to the DMOZ wasteland. https://en.wikivoyage.org/w/index.php?title=Wikivoyage:Travellers%27_pub&oldid=3159392#RelatedSites_at_Phabricatoryage, Feb 2017 - concluded with "AOL just announced that DMOZ is going offline in two weeks. The community will fork/mirror somewhere else but it's not clear when or where at the moment. —Justin (koavf)❤T☮C☺M☯ 01:08, 2 March 2017 (UTC)"
Declined CKoerner_WMF T57355 Should we merge Wikivoyage sidebar-link extensions (RelatedSites, Insider) into RelatedArticles ? T57355: Should we merge Wikivoyage sidebar-link extensions (RelatedSites, Insider) into RelatedArticles ? Is https://gerrit.wikimedia.org/r/335830 relevant? Does it need amending/abandoning in favour of something else? I'm not sure what the process for undeploying is. Who's going to make sure this happens? Do we need approval from anyone else? Disabling the extension is the first step and is a normal configuration change (in this case there is a global consensus), it can be done in multiple steps beginning from https://gerrit.wikimedia.org/r/335830 . Once the extension is disabled everywhere, we can immediately remove the configuration from mediawiki-config and then the branching tools (the reverse of https://wikitech.wikimedia.org/wiki/Heterogeneous_deployment#Add_new_extensions_to_extension-list etc.). Really not sure about what's going on here. If someone understands this and wants to take ownership and responsibility that would be great. I assume this is stalled until tech announcement. There is no missing information, this is not stalled. Jdlrobson removed a subscriber: Jdlrobson. Dont know what's happening here. For the record I'm very happy to disable these extensions (I don't like unmaintained code on our cluster), I just want to make sure if challenged I can point to appropriate discussions. The village pump links are very old and it would be good to summarise the outcomes of those discussions. Jdlrobson added a project: Community-Relations-Support. Okay, there is still not clarity here (due to the dead links in the description an missing links for other projects). If someone can post out to all the village pumps of Wikivoyage notifying communities that we are going to undeploy this, I will happily go ahead and swat this myself. Marking as stalled until that notice has gone out. I fixed the dead links in the task description. @Jdlrobson added a project: Community-Relations-Support. How does success of this task look like? How do we know when we are done? Created a new discussion on English Wikivoyage here: https://en.wikivoyage.org/wiki/Wikivoyage:Travellers%27_pub#We_need_to_remove_all_the_RelatedSites_links. kaldari added a subtask: T185246: Remove Citizendium from $wgRelatedSitesPrefixes. MaxSem added a subtask: T192013: Remove DMOZ support completely. TBolliger moved this task from Untriaged to Product backlog on the Community-Tech board. Jrbranaa added a subscriber: Jrbranaa. As CommTech are stewarding this extension through its sunset, they should probably be assigned to it. How fresh is the iwlinks table? 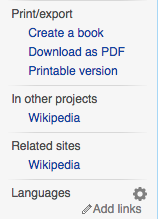 EN Wikivoyage manually replaced all known links, but this shows 1218 pages still link to Wikipedia. These numbers do not match up with the number of pages in the category Pages using RelatedSites(or equivalent) on these wikis. For example on English wikivoyage there's only 112 pages using RelatedSites according to the category. But the category page does not show all of the pages it should because those pages got the category added automatically and it's not until those pages are edited by someone that they will be "refreshed" and start showing up in the category page, if that makes sense. So the first thing we need to do is get the categories updated and then move to get consensus for removing RelatedSites from the projects. According to Max, it should not be hard to run a script to do the cleanup instead of having our editors do it. OK, found the problem: the iwlinks can't be used for what I'm trying to do at all. The only reasonable way is probably something like this search (note the namespaces: only subject and additionally File: is excluded to avoid results from Commons). So you're saying the category pages are definitely incorrect? Due to the way tracking categories are populated, I'd rather trust search, unless somebody wants to run refreshLinks.php across all Wikivoyages. Interesting that bnwikivoyage did not show up in the data from last year but it does now. bnwikivoyage did not exist (as a separate wiki) until this month (T196357). Niharika mentioned this in T62029: PHP notice with RelatedSites and Wikibase Client: Failed to map interlanguage prefix wikipedia to a global site ID. It would be nice if any of the developers enter the discussion. Thank you! I replied to the inquiry on meta. I think we're good to move ahead. MaxSem closed subtask T196587: Disable RelatedSites extension on English Wikivoyage as Resolved.